Rooting for a new croquet set? You’ve come to the right place. Croquet is not a modern era game. It dates back to the 17th century. It’s a fun sport that requires you to hit plastic or wooden balls with a mallet through a hoop. It’s played on a grass field so you’ll get some quality time to spend with nature. It’s a super easy and fun game to play and anyone can master this game easily. It’s a great pastime or a way to bond with your family. For this review, we have selected ten best croquet sets that will make your time with your family and friends way more enjoyable. Without further ado, let’s jump into the review. If you’re looking for a reliable and durable croquet set then the Crown Sporting is your guy. It has a solid construction that can take the beating for years. And with proper care, it’ll be as good as new for many days. This set will add up to the fun at any family event, picnic, and parties. The Crown Sporting features six 32” wooden mallets with rubber caps, 6 colored balls that are suited for all kinds of weather, nine vinyl coated steel wickets, and two hardwood stakes of 21”. It also includes a black zip-up carry bag where you can put all these equipment. When it comes about durability the Crown Sporting Goods Croquet Set will give others a run for their money. If you’re looking for a croquet set that will give you years of service then this is what you need in your life. The mallets and the stakes are made with extremely sturdy material to keep it going for years. The balls are polymer made. They weigh around 2 pounds each. The mallets and the balls on this set are quite heavy so they are not children-friendly. The GoSports Premium Croquet Set does justice to its name and it’ll surely give you that premium feel you’re looking for. Even though croquet dates back to centuries with its own sets of rules and colors, the manufacturer of GoSports Premium Croquet Set introduced some new colors in this set which makes them stand out in the crowd. It features includes six vibrant color mallets, six balls weighing 10oz each with the diameter of 3”, nine sturdy wickets and two end posts. The wickets are made with plastic coated wire. It’s a great outdoor croquet set that will increase the beauty of the yard to a great extent. This set also includes a handy storage bag so that you can easily carry it to the parks or to a picnic. The mallets fit perfectly in the bag even when fully assembled. The mallets and handles are made with hardwood which gives it quite a vintage look as well as durability. The handles are also a bit longer than the regular handles which makes them a perfect fit for the taller people. They also include a grip on them so the player can have better control throughout the game. The Franklin Sports Expert 6 Player Croquet Set is not an average Joe. It’s an elegant set with a beautifully lacquered cherry finish that will blow your mind on the very first look. This set is suitable for six people so it’s a great set to have some fun time with your loved ones. The best part of this set is that you can change the colors of the wooden stakes and the balls. It comes with six balls with 3.31” diameter each that are suitable for all types of weather condition. It features six 9”x2.5” wooden mallet heads attached with 36” wooden mallet shaft. They have a brass coating which adds to the durability of this set. The custom knurled hardwood head along with the brass fittings helps it endure some serious beating during the game at ease. This set also includes six 24” painted wood stakes and nine steel bent wire wickets. 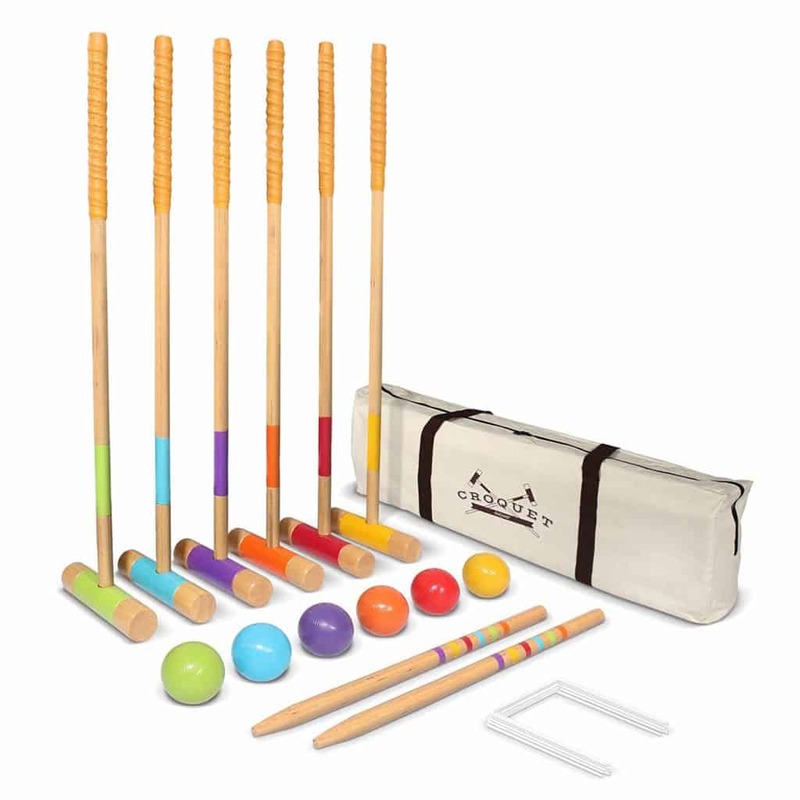 From the beginners to professionals, everyone can enjoy the goodness of this croquet set. You want to have a fun time with friends but don’t want to spend a ton on the croquet set? Well, then we have the solution for you. 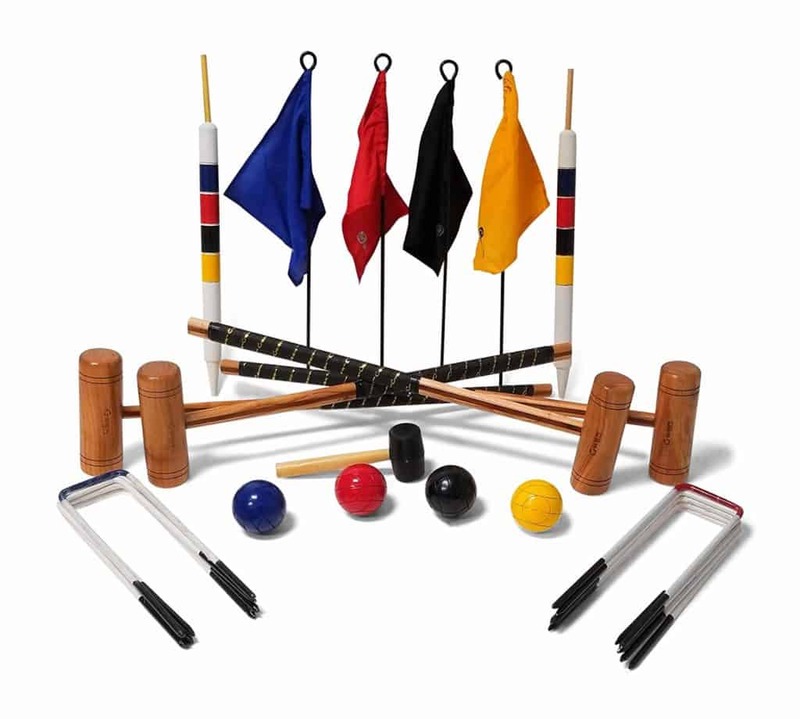 The Maggift Six Player Croquet Set is one of the most budget-friendly croquet set available in the market. Even though it’s super affordable, it does not compromise with quality. This set includes 6×26’’ hardwood handles that offers superb durability for the price. The 6×8’’ hardwood mallets also come with an additional cap to provide extra protection during the vigorous games. It also includes 6 weather resistant balls so that you can enjoy the game outdoors without any trouble. The wicket is super sturdy on this set. They come with a vinyl coating to prevent it against rusting. It’s a super light-weight six people croquet set that will enable you to have unlimited fun with your friends and family. This set comes with a carry bag so that you can take it outdoors with you. Overall, it has an excellent price to performance ratio. This croquet set does justice to its name and it’ll surely make you feel like a champion. It’s an ideal set to spend the leisure hours with friends or a fun day with the family on the backyard. This will take the fun of outdoor sports to a great new height. 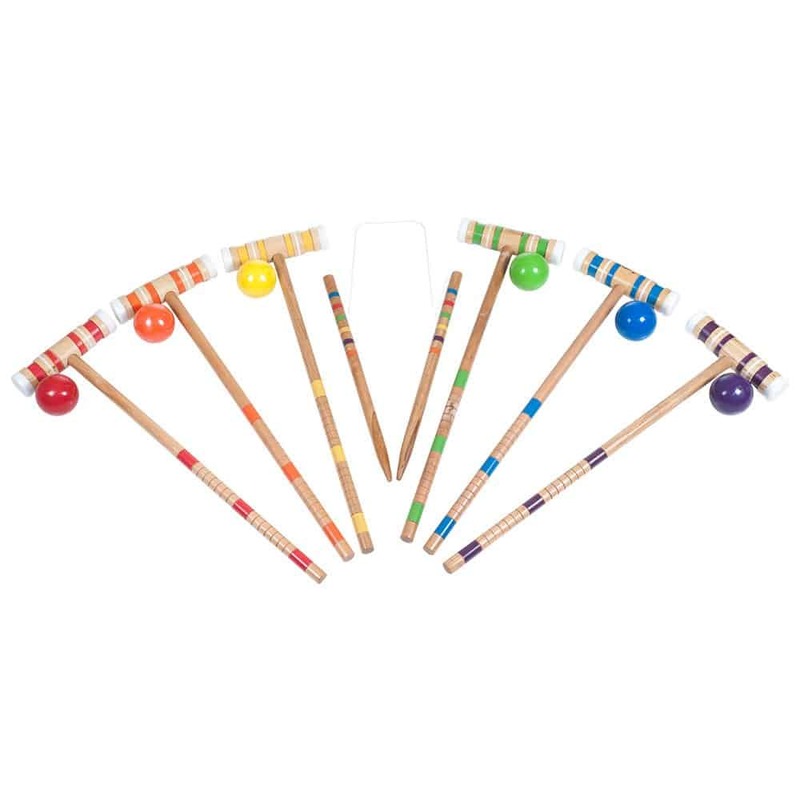 It comes with six Cottonwood croquet mallets with a colorful soft grip that allows you to have better control during the game. It includes six beautifully colored poly-resin croquet balls. The poly-resin material makes the balls very durable and save them from any wear and tear even after days of play. This set also includes nine 14” extremely durable steel wickets and two 24” hardwood scoring posts. The cherry on top is that it comes with a rulebook which you can take a peek at any time you face conflicts during the game. You also get a weatherproof travel bag with this set so that you can carry it around easily. On top of that, you’ll also get a 90 days satisfaction warranty. Hence, if you’re dissatisfied with the performance of this croquet set, you can return it to the seller within the given period. 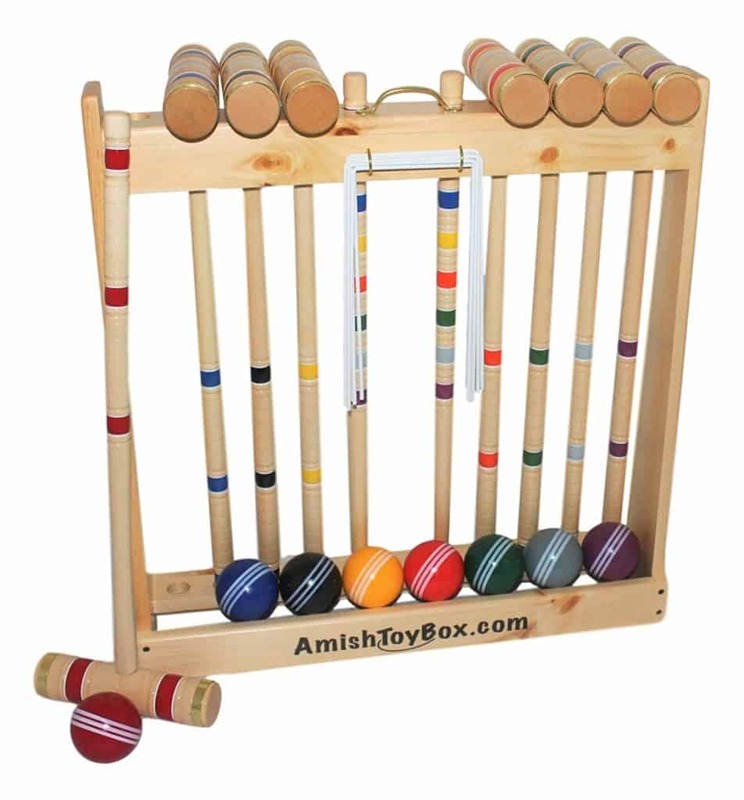 The Amish-Crafted Deluxe 8-Player Croquet Set is a high-performance top quality croquet set that’s one of the best in the market. It will surely give you a deluxe experience making your investment worthwhile. It’s handcrafted by the finest Amish craftsmen in Lancaster County, Pennsylvania who ensure that it’ll provide incredible durability for years. The finesse of this entire set will astonish you the very moment you get your hands on it. This set comes with eight Maple mallets that are made with utmost care. The mallets are also hand-painted with the corresponding color of the balls. There two rings on the mallet head that are made with polished brass to increase the durability of it. It includes handles with two different height of 28″ and 32″ so that people of all ages and height can enjoy this croquet set. This also comes with super durable and lightweight plastic balls and metallic balls that will last you for years. This Deluxe set also comes with a wooden holder that doesn’t only add to its durability but also makes it more sophisticated looking. Overall, it’s the best quality croquet set money can buy and the experience you’ll get will be totally worth the investment. The Baden Deluxe Series Croquet Set is another superb creation by Baden that offers superior quality at a very reasonable price. It’s a six-player croquet set that comes with six hardwood mallets of 27 inches. The size of the mallets makes it very suitable for the kids. So, if you’re looking for a way to have some fun time with your kids then the Baden Deluxe would be the perfect croquet set for you. This set includes six multi-colored balls made with poly-resin. The poly-resin layer makes them extremely durable and they can survive through an intense game without any damaging effects. It also includes nine 8.25” steel wickets. This set also comes with two sturdy posts and an official croquet rule book to help you throughout the game. It also offers a nylon carry bag so you don’t have to worry anymore about carrying the croquet set to the playground anymore because this has got you covered. You also get to avail the 90 days satisfaction guarantee offer and return this to the seller if you’re dissatisfied. So, get ready to have some fun this summer with your family and we can assure you that this croquet set will not let you down. The Bud Light Trademark Global Croquet Set is an excellent croquet set that will make your time outdoors a very fun and memorable experience. It’s suitable for both adults and children so if you want to spend some quality time with your children then the Bud Light Trademark Global Croquet Set would an excellent choice for you. 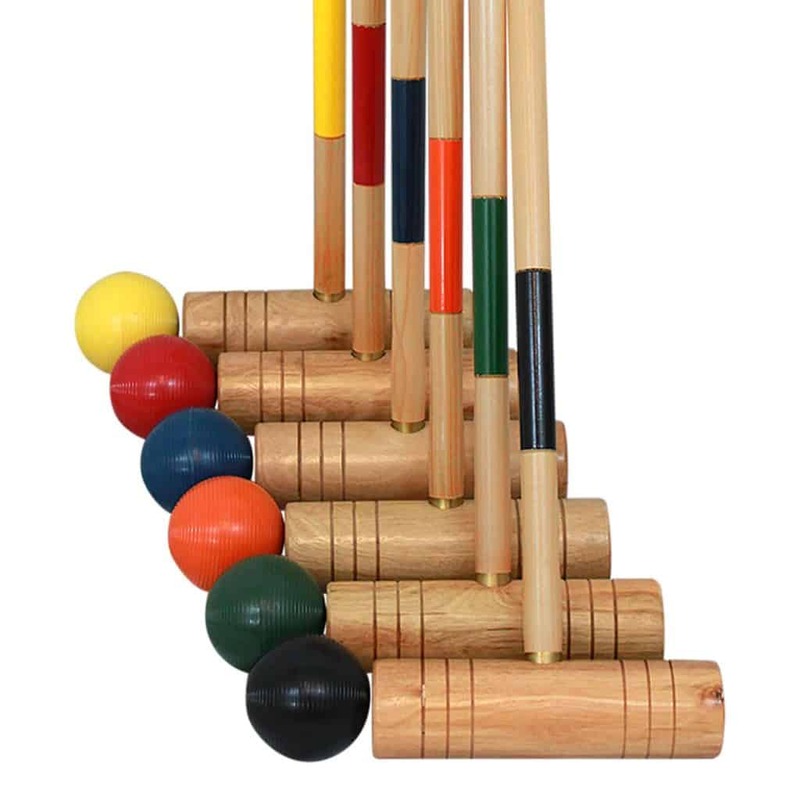 This croquet set is made with solid wood which gives it a very durable and sturdy finish. The vintage finish of it will win your heart at the very first look. It comes with six super long-lasting mallets with 26” handle and 1.85” diameter heads. There is also 2 solid 18″ long wood post along with nine vinyl-coated u-shaped wickets. The vinyl coating protects it against rusting, therefore, making it last for ages. It offers wooden made balls with a diameter of 3″ each. These balls have a protective coating which makes them last through all sorts of weather conditions. The Harvil Complete Six-Player Croquet Set another superb six players croquet set that offers limitless fun with a fraction of a price. It has six color strong mallets with a handle of 30” and a head made with chip-resistant bamboo. This set comes with six polymer made balls with beautiful shades of blue, green, red, purple, orange, and yellow. The balls have a solid build which prevents the mallets from chipping and ensures smooth rolling of the ball. There are also nine heavy-duty steel wickets that come with this ball along with two 24″ stake posts. Most companies don’t put much emphasis on the carry bag. 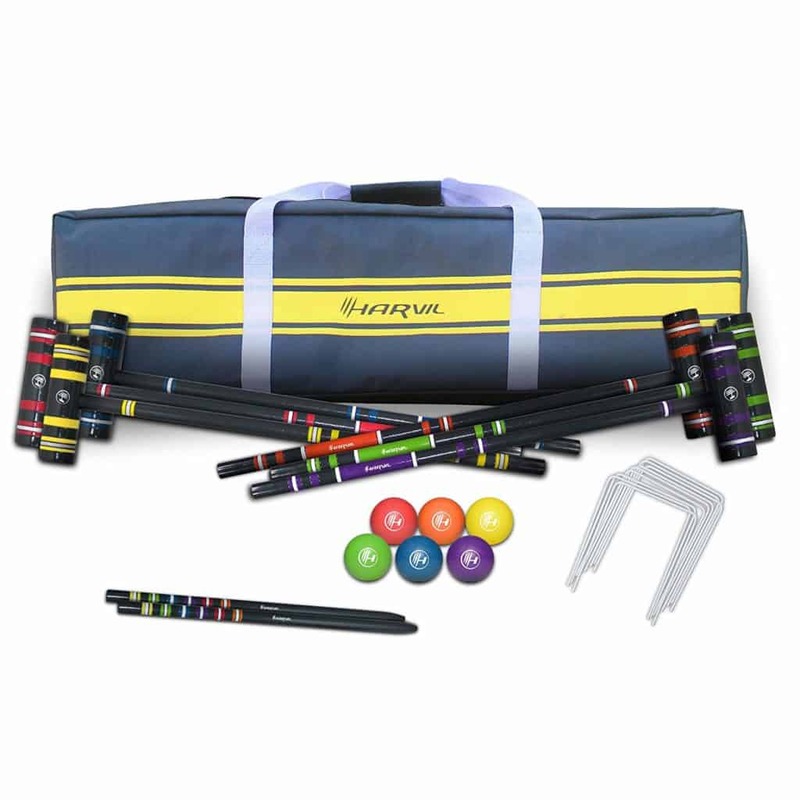 However, the Harvil Six Player croquet set will surprise you with its superior quality carry bag. This carry bag has compartments for easy storage of the equipment. The bag is also very well built with superior quality which will offer exceptional durability throughout the years. 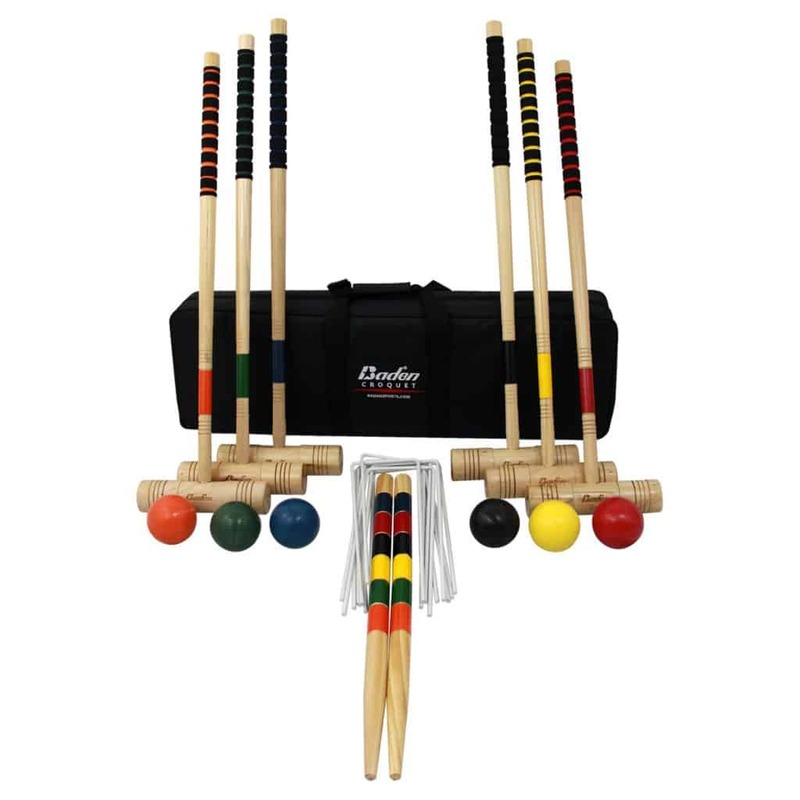 The Uber Games 9 Wicket Croquet Sets is a four-player set that is a great option for the players who are serious about the game. It’s a high-quality sophisticated croquet set that offers exceptional durability even with rough gaming sessions. 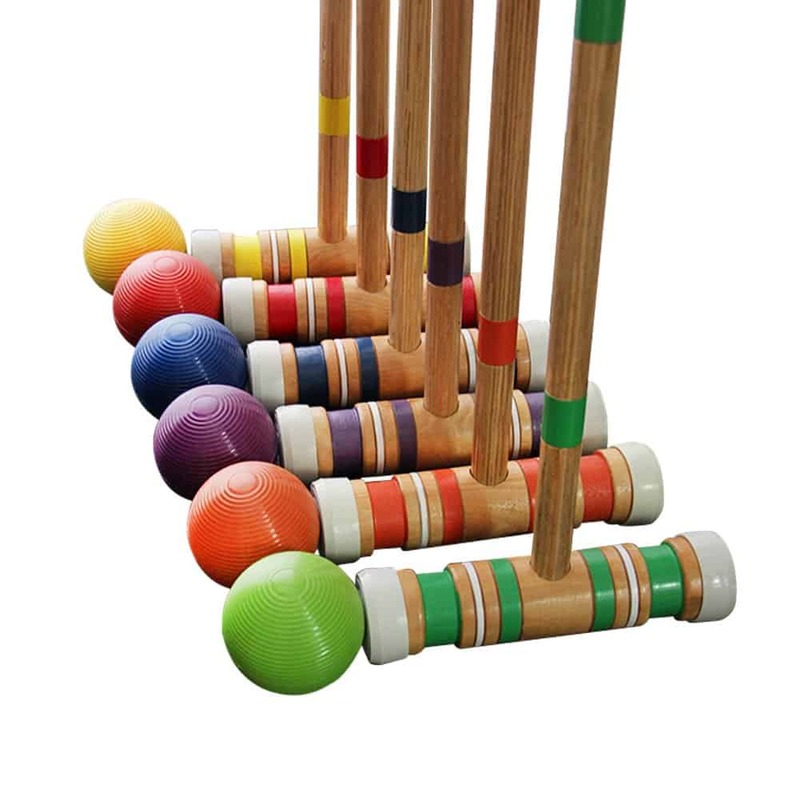 The best part of this croquet set is that it comes with two different sizes of mallets so that makes it suitable for both adults and the children. It comes with two 38″ mallets with 3″x9″ super durable hardwood head that will help you ace the game even during intense competition. You also get two other mallets with a height of 34″. It includes four super sturdy wooden croquet balls that weigh around 12oz each. Even though the balls are wooden, they are quite lightweight and long-lasting. The balls come in vibrant shades of red, black, blue and yellow. Even though the price of this set is on the steeper but it is justified as it also offers some incredible accessories such as corner flags, hardwood center pegs etc. It includes nine steel wickets that can work through all sorts of weather conditions. Croquet is a versatile game and it gives you the flexibility to play it o various kinds of grounds. However, the surface has some impacts on your game and your performance may vary from surface to surface. Croquet is a fun game that’s mostly played with family and friends in the back yard. So, the condition of your yard has an important part to play in this aspect. The length of your backyard grass has an impact on the game. If your yard is not properly manicured, the player will have a hard time keeping control over the ball. Artificial surfaces have become quite common these days as they enable the players to enjoy the game even in varying weather condition. Here the grass is more uniform therefore it enables the player to land on a more accurate shot. Golf croquet is played on a surface similar to a golf field. In this kind of surface, the grass it short hence the ball is able to move further and they also enable you to land on a more accurate hit. Before buying the croquet set, you need to consider the age of the player. If you’re buying the set for the whole family then a lawn croquet set will be an ideal choice as these contain lightweight hoops, balls, and mallets which makes it suitable for people of all ages. The game tends to vary with the number of players involved. Generally, there are four to six players in each game. You have also seen already that most sets usually come in a four-player or six player configuration. However, if you own a four-player set but there six or more people, you can always take turns and enjoy the game with everyone. Croquet has both formal and informal style of gameplay. In a formal game, you need to have your own mallet. However, in an informal setting, you have no such restriction. You can exchange and trade your mallets during the game. Another fun part of an informal game is that it enables you to decide your own rules of the game. The rules are quite negotiable and you can even change them according to your liking. 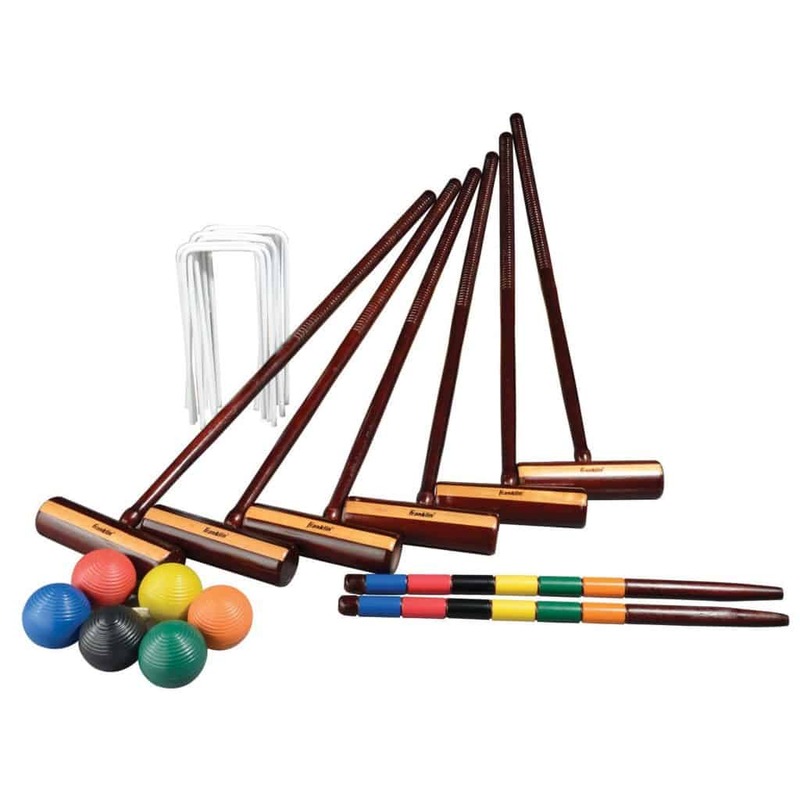 The lawn croquet sets are also a great addition to the collection of the beginners who don’t want to start off their journey with a heavy set. This set will enable them to play more comfortably and help to enhance their skills as well. On the other hand, for the advanced and skilled players, we recommend getting a set with mallets that weigh up about 1.4 kg. Advanced croquet sets tend to weigh more and they include high-quality mallets with a sixteen-ounce ball. These sets are popular among the skilled players because they offer better precision and higher accuracy level. Therefore, it enables them to have fun and excitement throughout the game. 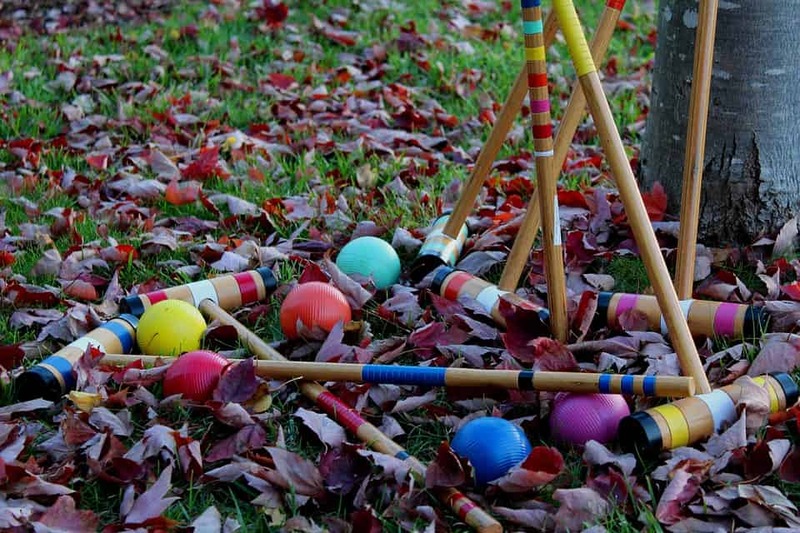 One of the most important features of a croquet set is its balls. The balls come in a variety of vibrant colors ranging from range, green, yellow, black, red, or blue. The colors usually correspond to the mallet that comes with the set. The weight of the ball tends to vary to some extent. Professionals or advanced players use balls that weigh sixteen ounces. However, beginners can adjust the weight of the ball to fit their playing style. This option enables the people of all ages to enjoy the goodness of the game. A mallet is a long stick that has a round head attached at the bottom of the stick and it’s used to hit the ball. The mallets are the most prominent part of a croquet set. This is something that you need to hold for hours and it needs to be durable as it has to withstand some pretty serious hits during the game. The number of mallets varies depending on the purpose of the game. The weight of the mallets varies with the material used to make them. Wooden mallets are usually made with tawa, ash or hickory woods. There are also mallets available that are made with carbon fiber, fiberglass, and aluminum. The beginner-friendly mallets tend to weigh less otherwise the player will have trouble hitting a long shot and the advanced players use the heavier ones. The weight of the mallet ranges from two pounds ten ounces to three pounds four ounces. The lightest mallets are made with carbon fiber and the wooden made mallets are the heaviest. The length of the shaft is another critical feature to decide. The shape of the shaft sometimes varies depending on the player’s playing style and comfort. Many players prefer octagonal or hexagonal shaft over the round ones as it provides them with better control. Most of the modern mallets have a square shaft instead of a round one. Using a rigid shaft will give you a better a control on the mallet when you try to stop a shot. Mallets with a larger surface area are preferred by the beginner as it reduces the probability of hitting the mallets head. On the contrary, mallets with a smaller surface area are preferred by the experienced players. Stakes are the targets that you aim for during the game. They have the colors of the balls on them which navigates you to hit them with the ball. It’s important that your croquet set is durable and sturdy enough to take the continuous hits otherwise your entire investment would be a waste. Wooden or metallic stakes are better options as they offer better durability. The balls are passed through the wicket which is tunnel-shaped equipment. Points are allocated for every wicket passed and the person with the most wickets become the winner. Wickets are usually made with plastic, wood, steel or wire hoops. Among them, the wired hoop wickets are the least durable. However, the other material provides a good amount of longevity and works well throughout the years. The material of the wicket needs to be sturdy because they are hit with both the ball and mallet. So, a wicket made with lousy material with eventually wear off quickly. People tend to avoid outdoor activities nowadays and they’re more into indoor activities. Croquet is a fun and versatile game that is not bound to any age limit. From kids to adults, it can be enjoyed by people of all ages. It doesn’t have any critical rules and it can be enjoyed over snacks and cola with your loved ones in the backyard. It’s a great way to exercise as well as bond with your closed ones. We have reviewed ten best croquet sets available out there to make your experience worthwhile. The buying guide is there to give you some insights so that you can make the best decision. 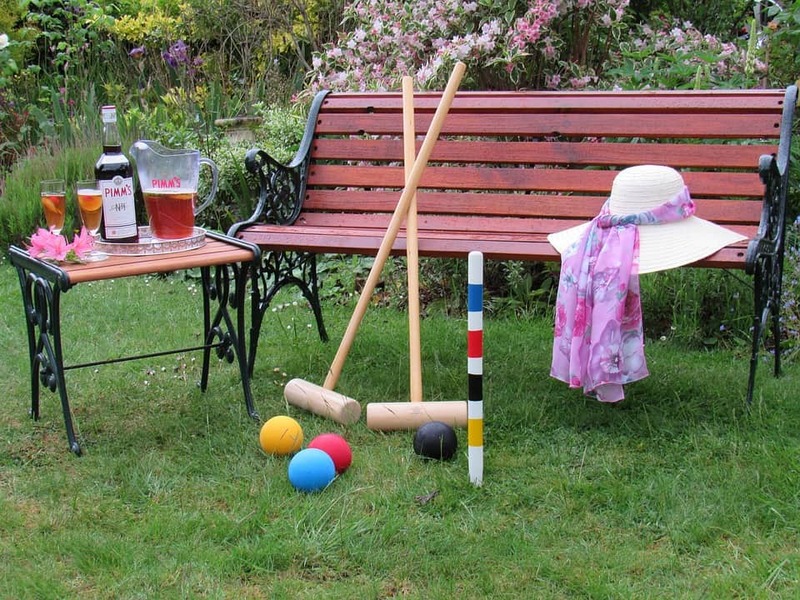 So, go out there, get the perfect croquet set for you and spend some crazy fun time with your friends and family. Best Storm Bowling Balls Reviews 2019: Which One to Buy?